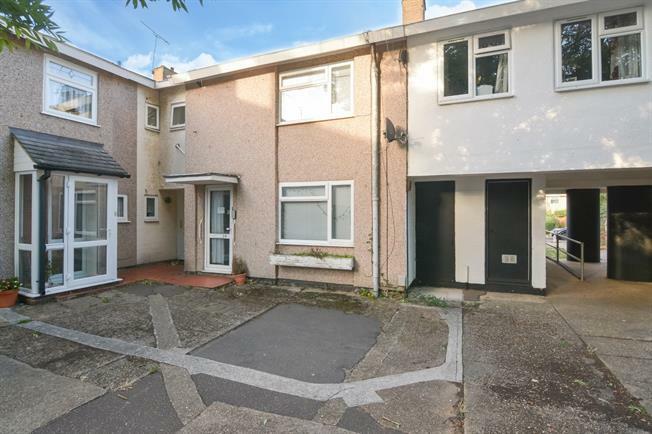 2 Bedroom Terraced House For Sale in Basildon for Offers Over £200,000. If you're looking for the perfect starter home then look no further. Boasting with potential and with situated within close proximity of a mainline station and the town centre. Internally the property features a downstairs WC, ample living space and generous sized kitchen. Spread across the first floor there's 2 double bedrooms, storage space and 3 piece bathroom suite. Externally the rear garden benefits from a back gate that opens out to communal parking. Double glazed window. Laminate flooring, chimney breast and exposed brick, artex ceiling, original coving, ceiling light. Vinyl flooring, artex ceiling, ceiling light. Roll edge work surface, wall and base units, stainless steel sink, integrated hob, over hob extractor, space for washing machine, fridge/freezer. Double glazed window. Vinyl flooring, tiled splashbacks, painted plaster ceiling, ceiling light. Touch flush, wash hand basin, extractor fan. Double glazed window. Radiator, laminate flooring, built-in storage cupboard, artex ceiling, ceiling light. Double glazed window. Radiator, laminate flooring, built-in storage cupboard, painted plaster ceiling, ceiling light. Double glazed window. Tiled splashbacks, artex ceiling, ceiling light. Standard WC, panelled bath with mixer tap, shower over bath, pedestal sink with mixer tap.